June 24, 2004, E. & L. Crabo. 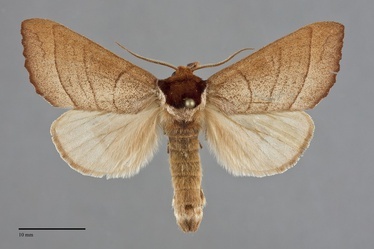 Datana ministra is a medium to large moth (FW length 19–25 mm) with smooth orange-brown forewings marked with three to four smoothly curved dark brown transverse lines. The spots are usually obsolete, although about half of eastern specimens show dark brown orbicular and reniform spots. The wing margin is slightly darker than the ground and are scalloped. 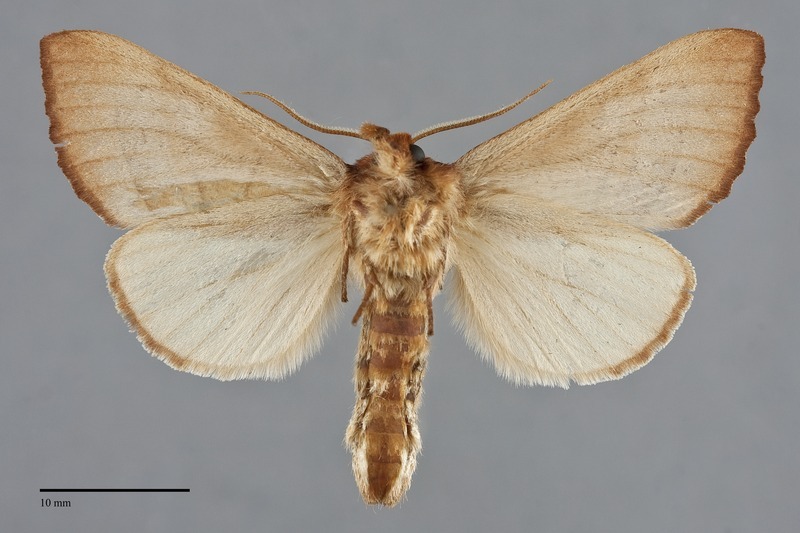 The hindwing is unmarked light yellow-brown. The head and all but the lateral and posterior portions of the thorax are dark chestnut brown, sharply defined against adjacent lighter gray brown areas. The male antenna is serrate, while that of the female is simple. This species is easily identified by its smoothly lined forewing and chestnut-colored thorax. Several similar Datana species are found elsewhere in North America, but their ranges do not approach the Pacific Northwest. Our two Nadata species have similar forewing color but lack dark brown on the thorax and have two white spots at the end of the cell. The larva is hairy, black with thin yellow stripes. It is illustrated by Powell & Opler (2009). This species is most common in eastern hardwood forests, and shows a disjunct and sporadic distribution in western North America where it mostly occurs in low elevation mixed hardwood forests and riparian zones. In the Pacific Northwest, the Willamette Valley population has not been seen since the 1930's and may now be extinct. This species is most common in riparian zones of the Rocky Mountain region extending to the Blue Mountains. Datana ministra occurs mostly in the northern and eastern portions of our region. Most records are from southeastern British Columbia, north-central Washington, and the border between eastern Washington, eastern Oregon, and Idaho. A few records exist for the Puget Trough and Willamette Valley, but these populations may have been extirpated. This species occurs widely in eastern North America, from Quebec to Florida and west to Colorado. In the West it is known from California outside the Pacific Northwest. This species is a generalist on many hardwood trees and shrubs including the families Fagaceae, Betulaceae, and Rosaceae. The adults are single brooded. They are nocturnal and come to light. Like other prominent moths they have vestigial mouth parts and do not feed. Pacific Northwest records span from late May to early August, with most records in late June and early July.